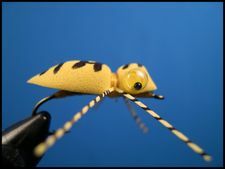 The Foam Spider is very easy to build, it's durable, and it's deadly on surface feeding blugills. As you might imagine you can make this little guy any size and color you want. The main component of the sponge bug is its pre-formed sponge body. Sponge bug bodies can be purchased in several sizes and shapes. 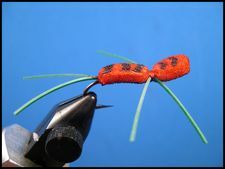 The Spong Bug is simple to build and it is very effective on surface feeding bluegills and bass. There are dozens of ways to build a fly to represent a grasshoppr, and the Crystal Hopper, even though it may be a stretch in realistic terms, is one of them. 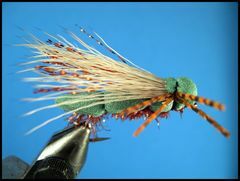 It may not look like the more traditional hopper patterns but, it can be deadly on bass, panfish, and trout. 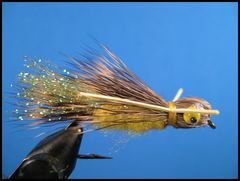 This little terrestrial was created by a guide on Utah's Green River to fish during their famous Cicada hatch which occurs in June of most years. I brought the fly home with me and have fished it with great success for summer bluegills and bass.